The first thing to say is that shifting into 5D consciousness does not mean you immediately leave the planet! Neither does it automatically mean you become ungrounded and spaced out - somehow disconnected from reality - not at all! 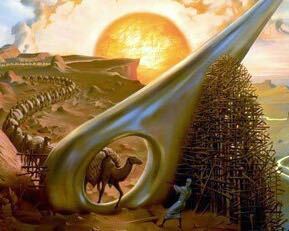 Right now we're living in two worlds now not one: everything you see with the physical eyes was built with the old 3D consciousness. That's what's getting increasingly challenged, as we're witnessing with abrupt climate change, dwindling natural resources and increasing financial instability. We're also seeing the judgmentalism and small-mindedness of humanity's shadow raising its ugly head. But there's a higher world interwoven through all this - a more expanded consciousness which is flowing through it. If you can align with that, then things will really take off for you, despite the craziness we witness all around. The important thing is a change in perception, which although may sound simple, requires 100% commitment to achieve: the flow will not give you the outcome the ego wants; it will not make things necessarily easy for you. In fact quite the reverse: it's going to challenge you in all the places you might hang on and identify - where you think a particular outcome is necessary for your well being. It's because the flow is designed to bring you to none-attached freedom - the essence of your soul. When we surrender in this way, then things do indeed get a whole lot easier. Where do you close down? That's where to open up! Here's the major misconception of the spiritual mainstream that leads many astray: although you'll initially get tasters of "love and light", yes, when you actually connect up to the flow, it'll take you into all the bottlenecks in life where you close down and get restricted - challenges in relationships for example where you need the other to be a certain way; challenges in careers, jobs and resources, where you might think you need more than you really do; challenges in living circumstances, where you believe you need a particular location or set-up; or else there's resistance to change from where you currently are. 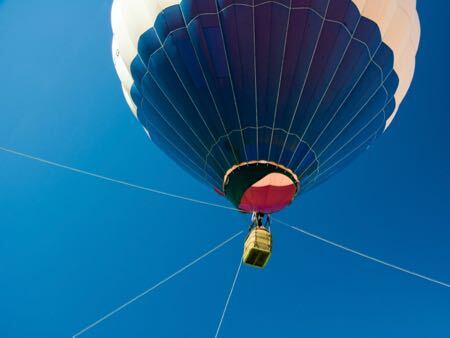 When you open up and truly connect to the flow, it feels like a hot air balloon rising upward (inward), pulling against its tethering (all the places you get stuck). So if this is happening to you, then it's a good sign, because you're actually aligning with the path. All you have to do then, is make the commitment to confront the "tethering" - where you tighten and get stuck. The point is, the flow of light is not aiming for anything in particular - other than the revelation of your expanded and miraculous cosmic self. But that said, it will create the most magnificent physical creations (as your balloon rises). It'll most definitely create through us when we're walking the path. It is, for example, creating a pristine new 5D reality all around us, with the consciousness of the old reality unraveling and ascending into it. If you're working toward that higher dimensional connection in all that you do, then miracles will surely happen around you. The car breaks down, you get a speeding fine or sacked from your job. It's easy to identify in such circumstances, to worry about the cost and the future. If you're really looking for 5D consciousness, then it's exactly these circumstances that present the golden opportunity - you must pass through the eye of the needle, by confronting your inner constrictions, as they arise. For only that way, can you process them out. I was out driving in Mount Gambier (in Oz) the other day whilst on the current Openhand Tour. I was in a borrowed car in a place that I didn't know. I drove straight into speed trap and was facing a $500 fine. But it turned out the traffic cop was from the UK and my old home town to boot! As I softened any inner tightness, anxiety or concern, a higher dimensional connection of consciousness between us ensured I was let off with just a warning. Awesome! What I've noticed is, that the more you commit to the exploration and revelation of self, the shorter the constricting bottlenecks last, and the more you expand with the flow coursing through you. It literally feels like a path of light is opening up before you. So how do you align with this flow? In short, you need a compass and a routemap. The compass causes you to confront what's really happening in the moment - by looking internally at how you react to external events. In essence, you work right into the tightness, unravel it, then unleash soul through it. This then shapes a new set of circumstances that are harnessing energy from the new 5D reality - synchronicity clicks in around you; your manifestations are increasingly supported by energy. And as you follow this flow, you begin to notice there's a pathway heading to a particular "place" - not so much a location, but a new way of being. See you somewhere down the flow!